Knostrop Foot and Cycle Bridge serves to reconnect the Trans Pennine Trail, following the removal of a section of island between the River Aire and the Aire and Calder Navigation. As the SSDA awards celebrate their 50th year of recognising the best of what the UK steel construction industry can achieve, we celebrate that 77% of the projects feature STRUMIS customers. In this post we will be celebrating S H Structures involvement in the Knostrop Weir Foot and Cycle Bridge project. 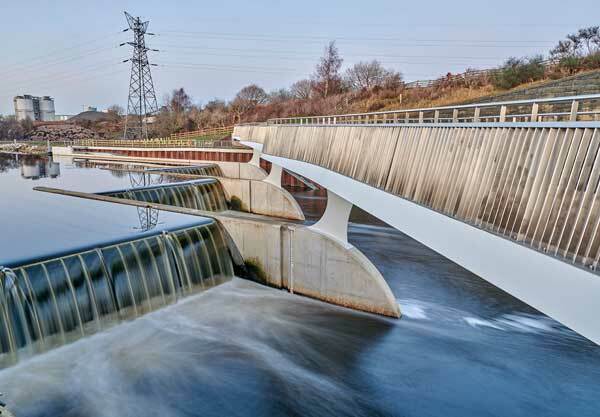 The Leeds Flood Alleviation Scheme (FAS) is led by Leeds City Council in partnership with the Environment Agency. It will provide the city centre and over 3,000 homes and 500 businesses with protection against flood events from the River Aire. Despite the apparent complexity of the final design’s appearance, it only requires a single curvature in the fabrication of the steel plate elements. This served to simplify fabrication and enabled the bridge to be delivered within budget and programme. A curved soffit combines with the changing deck width to translate the varying plan width into a rippling deck edge detail, producing a dynamic ‘sinuous’ quality, which is said to mirror the noise and movement of the falling water beneath. Another unique feature of the design is that in elevation the piers are only 50mm thick and almost invisible in long views, creating the illusion of a floating deck. Steel was the obvious material of choice to achieve the required aesthetic and minimise the significant construction challenges of working over water. The 70m long bridge was fabricated in S H Structures’ facility which is situated just 17 miles from the Knostrop site and treated at a local facility, minimising the environmental impact of the works.